The awesome little phone that could, webOS, is dead. 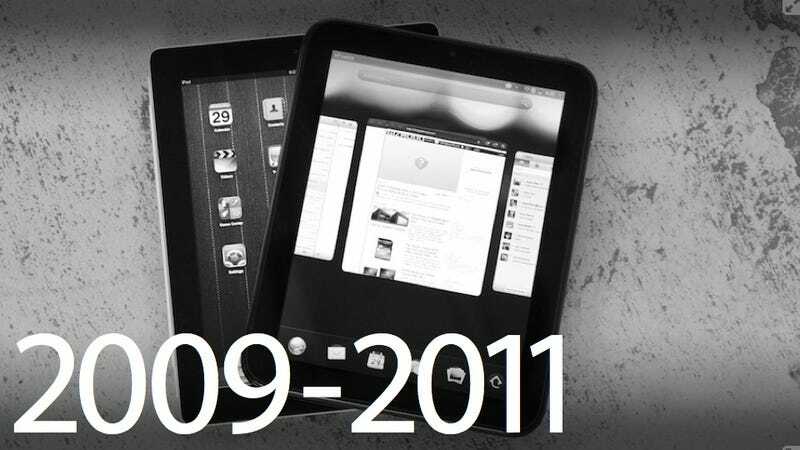 Discontinuing all phones and tablets, HP intends to "explore options to optimize the value of webOS software." If that's not murder, then it's certainly lobotimizing, de-limbing and leaving webOS in the middle of an ocean. Tragic. I bought the Pre when it came out two years ago. I've never been shy about loving it for the OS, which is about as well thought out as a mobile platform can get. The hardware, though above average, never thrilled me. It was attractive enough, especially when new. But once it got scratched, scraped and dinged up, the plasticky, pebble-like phone became ruddy and unremarkable. Add onto that the fact that the screen was too small and a vertical keyboard was more annoying than anything, and you were pretty much left wishing from day one that webOS was on a piece of hardware like the iPhone 3GS, or the HTC Touch HD. When you synced your Gmail, Facebook, Aim and Yahoo contacts, webOS automatically connected them all together. Messaging was a joy. Send a message to someone over SMS, AIM, Gtalk, whatever. Didn't matter. It all filtered into the same window as one epic conversation, transversing space time and a Babel of messaging protocols. The graphic design was coherent, unified and appealing. Multitasking was especially elegant, utilizing a card metaphor that is still unmatched by any other mobile OS right now. Swipe up from the gesture bar to bring up the card view, drag to reorder, and swipe up to exit. Same goes for their notifications system. I never spent less time trying to figure out the state of my emails, texts, IMs and messages than when I used webOS. Always visible, but never in the way. Save for some sluggishness, it was perfect. The apps would follow. I was certain. But after the initial launch, it never had the proper support from carriers, app developers or Palm/HP themselves. Palm lacked the resources to entice developers or roll out a bevy of devices. HP just had no desire or sense of urgency. (Obviously). For months, people hemmed and hawed about where Palm and its technology would end up. Google? They thought about it, but no. HTC? That's where I waned webOS to be, because HTC makes awesome hardware. Nope. When HP was mentioned as a possible suitor, I cringed. There was no way Palm could make it through that company in one piece. Of course, HP bought Palm. I frowned. But HP paints in broad, beige strokes. So I hoped. Palm had quality in spades; HP had the money to potentially turn that quality into quantity. Everyone thought that HP would hit the ground running with webOS. In the years leading up to their acquisition of Palm, they had seemed anxious to get in the mobile game. By the time HP announced the Pre 3 and the Touchpad this past winter, all I could do is worry about webOS being offloaded onto undercooked, ill-conceived products. Printers! Toasters! Tablets! It was their last big stand, and neither product offered anything truly new or original. Summer sequels. In their conference call today, HP said they'll try in earnest to find a third party home for WebOS to live in. And while I'd love for nothing more than for a handset maker to come in and make the platform relevant, it's wishful thinking. Who's going to put webOS on a device when the company that owns it wants nothing to do with it? More importantly, who's going to buy that device?